This is our Toddler program for children ages 2 and 3, with a ratio of 1:5. It is a half-day drop-off program that nourishes the senses and allows for self-initiated exploration and movement! Our warm, homelike environment provides a safe first step toward school. A predictable rhythm shapes our time together, filled with song and activities that bring joy and goodness to the children's day. Our 15-acre campus allows for the physical exploration of space that helps build self- confidence, resilience, curiosity, and joy in the young child. The class will include up to 9 children. Both co-op and standard options are available, depending on a family's needs. The class meets Monday, Wednesday, and Friday and the hours are from 9am - 12:30pm and follows the same calendar schedule as our school. We refer to our early childhood program as a Kindergarten, according to the original usage of the term. It is a mixed-age, play-based program for ages 4 - 6. We offer half-day (8:50-12:30) and full-day (8:50-3:00) options, and students may participate 2, 3 or 5 days per week. The school day begins at 8:50 am, but you are able to drop your child off after 8:15 as there is playground coverage from 8:15 – 8:50 am when the school day begins. All children possess a fresh, natural sense of wonder and yearn to express this capacity in a social environment with other children. Our Forest Kindergarten program allows their childhood gifts to unfold in a gentle atmosphere of beauty, natural elements, and human warmth. Through a daily and weekly rhythm which takes them both inside the classroom and outside to the forest, our children are given a solid foundation in which to learn and play. Children learn by imitation, and soak up the world around them, and thus the Kindergarten teachers bring meaningful activities to their class so that the children have a wonderful model to observe. Daily activities in the class may consist of assisting with the daily snack (making bread and butter, chopping and shredding vegetables), arts (such as painting, coloring, handwork, finger knitting, clay work, or seasonal crafts), and also daily responsibilities for the classroom and the materials inside it. The first seven years of a child’s life are devoted to the development of the physical body and PLAY is the child’s work in the Kindergarten. Neural pathways in the developing brain are laid down through movement and imaginative play, building a strong foundation for later academic learning. Plenty of free, unstructured play encourages problem solving, creative thinking, and facilitates healthy social interaction. Children learn through imitating the world around them and if children are given the opportunity to imitate that which is beautiful, meaningful and true, then they are able to go forth in life with initiative and purpose. In a warm, loving, physically beautiful, and carefully structured homelike environment, the child’s day naturally flows between guided activities and freedom in play. The day follows a regular rhythm, a practice that builds security, confidence, and a sense of order and that forms the beginnings of healthy life habits. We also have an expansive outdoor classroom, which we spend time in each day, rain or shine. 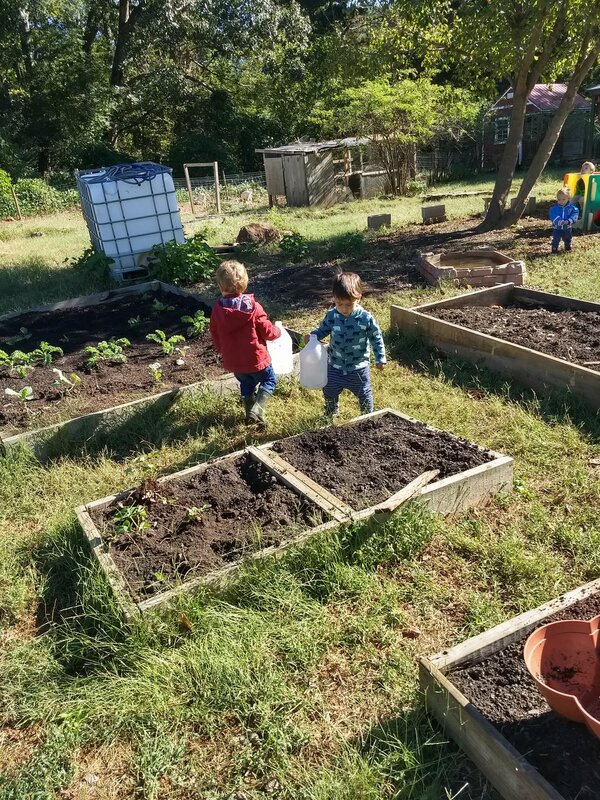 With 15-acres of land, our Forest Kindergarten will visit the playground, garden, and Kindergarten Basecamp in the forest and near our beloved Little Noonday Creek. As a general guide, children will spend at least 2.5 hours a day outside in summer and winter, and most of the day outside in the spring and autumn. The Forest Kindergarten teacher is the model for the child demonstrating purposeful use of language, meaningful physical movement, and cultivation of beauty. Our teachers are specifically trained individuals who, through rhythm, repetition and reverence, are able to create a wholesome environment that nurtures the physical, emotional, social and spiritual development of each child. They are also skilled naturalists who encourage a budding sense of scientific curiosity and engagement with the natural world.